You can also apply by downloading Form 6 from the election commission official website.Fill in all the information and attach your passport size photo in the given space.You have to attach one address proof and one identity proof along with the application. Submit the duly filled in application form either by post or personally to the VREC office. To find your State Election Commission Official website, click here. The Booth Level Officer (BLO) of your area will visit the address mentioned in your application.The BLO will verify the photograph with you personally.He will confirm your address of residence.If you did not submit your address proof and age proof while submitting your application form, you can submit it to your Booth Level Officer when he comes for verification. I Am An NRI, How Can I Apply For Voter ID Card? There are many Non-residential Indian citizens living all over the world. People who meet all the factors given below can apply for voter ID card. I Have Received My Voter ID Card But There Is A Mistake, What To Do? If there is a mistake in your voter ID card, visit your state CEO website and download Form 8. Fill in all the required information along with a proof for correct information. Do not forget to attach one address proof and one identity proof. Submit the duly filled in application form in VREC of your assembly constituency. In case the mistake is from the end of election commission officials, correction will be done free of charge, if the mistake is from your end you have to pay INR 25 along with your application. How To Check My Name In The Voter’s List? After the verification of your application, your name will be included in the voter’s list. To check your name in the voter’s list online, visit election commission of India official website. Click on’Check your name in voter’s list’ link and select your state. This will lead you to the respective state CEO official website. You can check your name in the voter’s list in two methods, either by your name or your voter ID number (EPIC number). You can also check your name in the voter’s list by visiting your respective state election commission website instead of logging on to election commission of India Website. You can check your in the voter’s list offline by sending a text. To do so, you have to send a text in a particular format specified by your state election commission. Information related to elections and other voting related tasks can be easily accessed through election commission of India website. For updates about your assembly constituency, you can visit your state election commission website. For collecting voter ID from E SEVA ,Rs 40/- collected. 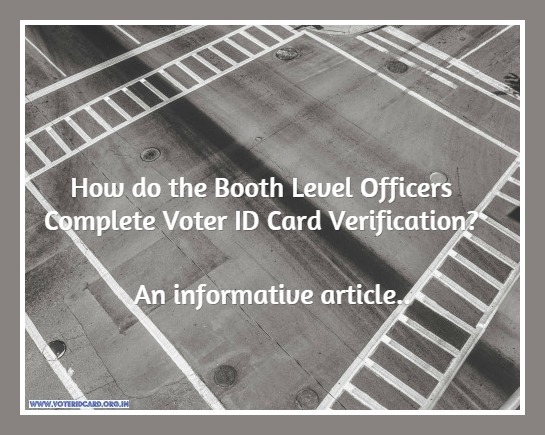 How do Election Officers Conduct Voter ID Card Verification?